A cruise ship that can accommodate more than 3,600 passengers is being built for the British market. A 'keel-laying' ceremony marked the start of construction work on P&O's new 141,000-ton liner, which has not yet been given a name but will likely have already captured the attention of those who enjoy the luxury and relaxation of cruise travel. Once it takes to the high seas the ship, which is costing almost half a billion pounds to build, will be able to hold 3,611 passengers. They will be accommodated in 1,812 cabins and be served by 1,350 crew members, making what P&O describes as a 'modern classic' the biggest cruise ship built for the UK market. It will also boast no fewer than 17 public decks and be fitted with up-to-date green technology with its interior design being put in the hands of British hospitality design firm Richmond. Richmond has pledged to give the £489-million ship a modern design and facilities that will appeal to seasoned cruise customers as well as those new to the experience, all of whom would be advised to take out cruise travel insurance for their holidays at sea to ensure added peace of mind. P&O says bringing in the design firm means passengers should be able to expect the same level of quality as guests at some of the world's top hotels. Carol Marlow, managing director of P&O Cruises, said the keel-laying had marked the transition from drawing board to construction of the enormous liner, which will join the firm's other Southampton-based ships. She said: "We're working hard on the interior and exterior design of the ship. We're surrounded by material samples and carpet samples - all sorts of exciting things! 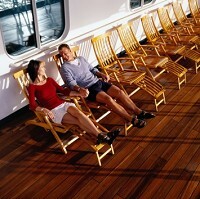 "There are signature P&O concepts on this ship, along with brand new ideas and places for people to go."